A team of astronomers has performed one of the highest resolution observations in astronomical history by observing two intense regions of radiation, 20 kilometres apart, around a star 6500 light-years away. The observation is equivalent to using a telescope on Earth to see a flea on the surface of Pluto. The extraordinary observation was made possible by the rare geometry and characteristics of a pair of stars orbiting each other. One is a cool, lightweight star called a brown dwarf, which features a "wake" or comet-like tail of gas. The other is an exotic, rapidly spinning star called a pulsar. "The gas is acting as like a magnifying glass right in front of the pulsar," says Robert Main, lead author of the paper describing the observation being published May 24 in the journal Nature. "We are essentially looking at the pulsar through a naturally occurring magnifier which periodically allows us to see the two regions separately." Main is a Ph.D. astronomy student in the Department of Astronomy & Astrophysics at the University of Toronto, working with colleagues at the University of Toronto's Dunlap Institute for Astronomy & Astrophysics and Canadian Institute for Theoretical Astrophysics, and the Perimeter Institute. The pulsar is a neutron star that rotates rapidly—over 600 times a second. As the pulsar spins, it emits beams of radiation from the two hotspots on its surface. The intense regions of radiation being observed are associated with the beams. The brown dwarf star is about a third the diameter of the Sun. It is roughly two million kilometres from the pulsar—or five times the distance between the Earth and the moon—and orbits around it in just over 9 hours. The dwarf companion star is tidally locked to the pulsar so that one side always faces its pulsating companion, the way the moon is tidally locked to the Earth. Because it is so close to the pulsar, the brown dwarf star is blasted by the strong radiation coming from its smaller companion. The intense radiation from the pulsar heats one side of the relatively cool dwarf star to the temperature of our Sun, or some 6000°C. The blast from the pulsar could ultimately spell its companion's demise. Pulsars in these types of binary systems are called "black widow" pulsars. Just as a black widow spider eats its mate, it is thought that the pulsar, given the right conditions, could gradually erode gas from the dwarf star until the latter is consumed. In addition to being an observation of incredibly high resolution, the result could be a clue to the nature of mysterious phenomena known as Fast Radio Bursts, or FRBs. "Many observed properties of FRBs could be explained if they are being amplified by plasma lenses," say Main. "The properties of the amplified pulses we detected in our study show a remarkable similarity to the bursts from the repeating FRB, suggesting that the repeating FRB may be lensed by plasma in its host galaxy." The pulsar is designated PSR B1957+20. 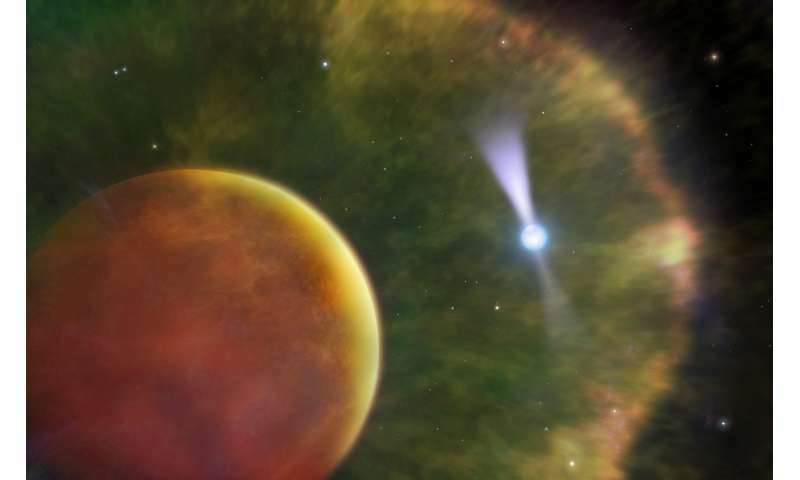 Previous work led by Main's co-author, Prof. Marten van Kerkwijk, from the University of Toronto, suggests that it is likely one of the most massive pulsars known, and further work to accurately measure its mass will help in understanding how matter behaves at the highest known densities, and equivalently, how massive a neutron star can be before collapsing into a black hole. Main and his co-authors used data obtained with the Arecibo Observatory radio telescope before Hurricane Maria damaged the telescope in September 2017. The collaborators will use the telescope to make follow-up observations of PSR B1957+20. That is one of the most spectacular images I have seen, quite beautiful. Usually images are noted as being artist's impressions where that is the case. Not sure why this isn't.